I’m thrilled to announce the latest release in my Amish series Seven Brides for Seven Bachelors. The Kissing Bridge is the story of a young woman caught between a stifling Amish community and the unnerving outside world and the daredevil bachelor determined to find an Amish woman who can quench his thirst for adventure. I’m celebrating by hosting a “Beautiful Bridges and Special Kisses” giveaway. I want to hear about your favorite bridge and your most special kiss! I’ll go first! Click here to read all about my favorite bridge. 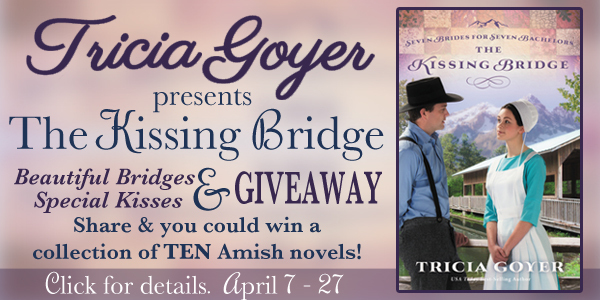 Tell @TriciaGoyer about your favorite bridge or special kiss and you might #win! I’ll choose FIVE winners to receive each receive a collection of TEN Amish books! To enter all you need to do is write a post on your blog about one or both of these topics and then come back here to LINK UP your post. Share your links to the “Beautiful Bridges and Special Kisses” post(s) below. I’ll pick some each day to stop by and read. Please take a few minutes, as well, to stop by others’ posts and add a little beauty and sweetness to your day! The Church Street Bridge that crosses Cane River Lake is very pretty. Oh, I’ll have to go look that up! I have to the San Francisco Bridge. The most special kiss was from my grand baby. Shared on FB, TWEETED and shared on Pinterest. The Golden Gate Bridge is amazing! And grandbaby kisses are the best. I would have to say the Golden Gate Bridge and my special kiss that I shared is with my Grandma who is 90. Danie, My grandma is 84. I love spending time with her … she lives with us! The most beautiful bridge I have seen is the Golden Gate Bridge. The most special kiss was in my living room, sitting at my piano, was playing hymns, my boyfriend at the time turned to me, after singing a few hymns, kissed me, wow, hot with passion, it was then he said he better leave. Wise decision, but will never forget that kiss. Juanita, WOW! I love that. Thank you for sharing!! There are the most fantastic bridges in Poland. They are the lock bridges where lovers put “locks” on the bridges and through the key into the river below. This is to represent their undying love. My special kiss? hmmmm. I’m not tellin’. The most special kiss that I have received is the last one I got from my Dad. He passed away in 2007 at the very young age of 63, so I will treasure that memory forever. I tweeted this contest and will share on facebook as well. Thanks for your generosity in sharing your wonderful stories with those of us who love to read. Tina, that is SO special! Thank you for sharing! My most special kiss was with my grandpa right before he passed away. My favorite bride is the Keefer Mill Bridge a few miles outside of our town. My daughter Michelle and her husband Terry were married on that bridge 16 years ago next month. My daughter married a Keefer, so it was appropriate. Their initials are carved on the bridge and Terry gave Michelle a print of the bridge one year for their anniversary. My special kiss is the last one I gave my daddy while we were all with him as he passed on to join my mother in Heaven. Mary Ellen, that’s a wonderful story! It sounds like a novel! That is a VERY special kiss, too! When my gr. granddaughter ran to me saying, ‘Gramma Schilling’, jumped into my arms, kissed my face and snuggled into my neck!! Tricia, the most beautiful bridge I have ever seen is the NEW RIVER GORGE BRIDGE located at Fayetteville, Fayette County, West Virginia. When you are on the road you do not realize you are on the bridge! There are pull offs to see the beauty. When you stand on the bridge or one of the look overs, you see a train track running right along side the New River, one of the world’s oldest rivers. Some times you are lucky enough to see a train going by. In the fall of the year when the foliage is at peak in color, it is an awesome picture of God’s handiwork!! Also, I would like to send a special kiss to our son, who will be spending his birthday with Jesus this year on the 15th of April, as he passed away suddenly of a heart attack Jan. 18, 2014. Our hearts are still broken and we’d give anything to have him here with us on his birthday. Thank you so much for the opportunity to enter the giveaway and I would be delighted to be one of your winners. God bless you friend. Oh, Ruth! I’m so sorry about your son. I’m sure he is aware of your love and kisses!! That sounds like a very cool bridge! The bridge below where I grew up where they used to have baptizings. I facebooked it and pinned it too. I like the lock bridge I think that it is cool that people put locks on the bridge for their love to one another. I would like to go and do that. My favorite kiss is the kiss that I gave to my mom when she came out of her coma. they did no wiether she would wake up but she did I was so happy. Thanks be to God. I grew up as a child loving bridges. I would see one in the distance and want my father to go over it. The best bridge I’ve ever been on is the Chesapeake Bridge Tunnel. It’s amazing, but only if you don’t mind seeing land for part of the drive. My most special kiss was the first one from my husband of 28 years. My favorite bridge is in Oneonta, Al and its a covered bridge dating back to pre-civil war time. First time my new husband had taken me to it. We had only been married a few weeks (1967-summer) and he drove across it. You can only imagine how I felt. I’m terrified of old, narrow bridges. Also one that are high. I didn’t mention, I drove across the 7-mile bridge going to Key West. I couldn’t hide it from my husband the first time we went across. You can’t hold your breath and keep your eyes closed for 7 miles. That was almost 47 yrs ago. Coronado Bridge, San Diego to Coronado over the Bay. It has a beautiful curve and I’ve seen it by driving across it and riding in a tour boat underneath it. Mackinaw Bridge very near Mackinaw City in Michigan. Very beautiful and breath-taking in the springtime, summer and autumn months. Although, I have not been kissed on the bridge but have been kissed underneath it in a boat! Mackinaw Island is one of my favorite places to take a vacation. My husband and I fell in love with this place! Thanks for giving away all the books that you have now and in the past. I love reading your books. My husband has been buying them for me as gifts after he found out you are one of my favorite authors. There was an amazing draw bridge over the Black Warrior River where I grew up. I used to love watching as it stopped traffic to raise up and let tall boats or barges go through. Sadly it is no longer there. Good memories though. Besides from my husband my sweetest kiss was the first one my grandson gave me willingly. Love your books and love reading Amish fiction. Shared on Facebook. My favorite bridge was not a covered bridge but when the water was high it would flow over the bridge which was rock. The bridge was redone a few years ago so it is not the same. It was beautiful and was called Rock Bridge. I do not have a blog. I will share this on my facebook page. My favorite bridges are anyone located in Lancaster County, Pennsylvsnia. Such as the Hunsecker Mill Bridge, Belmont Bridge, etc. You haven’t been on a gorgeous bridge until you’ve been on Michigan’s Mackinaw bridge! The view from there is amazing. Big tankers below it look like toys! But I also love the bridge built in Frankenmuth that looks exactly like the bridge I see in the picture you posted at the top of this page. They built it with wooden pegs; no nails! And they hauled it into its place with a team of oxen. I know that bridge in Frankenmuth. love it. I wish I had a blog to enter this giveaway. Well we don’t have any bridges where I grew up. But I can tell you one special and first kiss is when I was 5 yrs old and I was walking him home so he wouldn’t get lost through the timber. He gave me a quick peck on the cheek and thanked me to getting him home. We were best friends all through school…after graduating we went our separate ways. But every reunion we have he always tells the story of our first kiss 50 years ago. My favorite bridge is the Golden Gate Bridge. Kisses from my Momma were always special. I miss them so much. Some might find this in poor taste…. but I will always treasure the last kiss I received from my husband before he passed away. I relive that event every day. I have never read any of your books… I am so excited to have found you!!! I will be purchasing several, but I will have to print off your list so I can figure out a good place to start! I love our Harbor Bridge in Corpus Christi, Texas. It is the only bridge in the country that is lighted to change colors show graphics such as the American flag blowing in the wind -all in lights. At Christmas there are Christmas greetings on it to welcome guests to our city and Christmas graphics (balls). People drive near it and park to watch the light shows it gives each evening. It is very special light up in the night sky. I know we have memories with loved ones there, especially our grandchildren. When I was young, we lived on a hill in Richmond Heights. With a big widow across the front of our house, we were able to look down on the bay, including the Golden Gate Bridge! It was fun watching the ships go under the bridge! My favorite bridges are the covered bridges (30+) in Parke County Indiana in the spring with the redbud trees in bloom and the Golden Gate Bridge. I’ve read many of the posts and I’ve been on several of the mentioned bridges so it is really a difficult choice. As for kisses, I agree with lots of others that the kisses from my granddaughters are the best! I have no blog, so guess I can’t enter. But my most unusual kiss is from our one cat. She licks me on the cheek the way a dog would. The most beautiful bridge I ever saw was in Heartland, Ontatio, Canada. It literally was the world’s longest bridge. Isn’t that a romantic name for a town? The best one is is just a bridge going through the woods where we hunt, we scattered my fathers ashes there. I loved crossing the old metal overhead bridges in Southern MN on the way to relatives in Souix Falls, SD…. I think the bridges were in Grannate Falls, MN I loved the look of them, and the happy memories of visiting relatives at destination end mingle. Probably my favorite bridge would be the War Eagle River Bridge at War Eagle Mill in Arkansas. It is such a beautiful and peaceful place. The view of the mill and the river from the bridge is gorgeous whatever the season and the view of the old bridge is fabulous too. We have been there many times during the craft shows, to buy corn meal & other grains, to go fishing, and just to visit the mill. My favorite kisses are from my grandchildren: Kaleb thinks he is too big to be kissed, but will pretend he hates it and kiss me quickly on the cheek. Olivia has the sweetest spirit, but a little low self-esteem so we have a special thing between us. I kiss her on the cheek and she kisses mine, then we rub noses. Then there is little Mykayla who sometimes imitates her older brother and says she doesn’t like “kissies,” and will only allow a peck on the cheek. And other times she squeezes and kisses me so hard it takes my breath. But each kiss is special and I wouldn’t take a million dollars to give up even one. My Grandmother is 99 this year, she still lives in her own home on the lake and still drives downtown during the day, she has card parties bridge and euchre twice a week at her place, she still cooks full meals for herself. She makes beautiful stationary with pressed dried flowers. She lives 3 1/2 hours from me. When ever I can get to my Grandmothers house and she meets me at the door with a hug and a kiss, I have to say every time I count my blessings because I do not know how many more kisses and hugs I will get from her. She is very dear to me and I spend as much time in Lakeview Michigan as possible! By the way, there is a very large Amish community up there so seeing their horse and buggies are a common site there. I’ve gone to their homes and bought rugs, to another to buy cinnamon rolls, to another to buy a wooden spinner for the top of the roof of my Uncle’s home….Grandma and I visit their cheese factory often. So I love to read about them! My favorite bridge would have to be the Brooklyn Bridge. When my son made Chief in the Navy, he paid for me to fly to Virginia and gave me the honor of pinning him. I gave him a big hug and kiss and told him how proud I was. Thank you for having this contest, I hope I win. Mackinaw Bridge in Michigan is my favorite and I did post about your giveaway and I posted about special kisses above. The most notable bridge I have ever seen was at Vancouver Bay Ontario when I saw the Queen Elizabeth at dawn going under the bridge there.That was clear back in 1974! My first kiss from my husband the day we met and he told me he was going to marry me. We had just met and I didn’t hardly know his name! After being married for almost 32 years now and many many kisses later I am still thrilled over that kiss. It was all in God’s wonderful plan that we meet and have a beautiful life together. Thank you for the opportunity to win your books. I have two favorite bridges. Just saw them in April when I went to Ohio to see my oldest daughter and two grandsons. We go over them while going to different events there. DOn’t know names of them. My favorite kiss is from my husband on my second date. Why? Because we are facing 35 years of marriage and I can say he is the only guy I ever kissed. My favorite bridge would be the Coronado Bridge in San Diego, CA. It crosses the San Diego Bay and has a beautiful curve in it. I have driven over it and boated under it in a sailboat with our sons and on a tour boat. I can’t think of any bridges right now must be a senior moment! I would love to see the Golden Gate Bridge. The bridges in my part of Texas are as plain as they can be, no major rivers or waterways. Need more experience with special kisses! Favorite Bridge in WV is the New River Gorge Bridge! Bridge Day is celebrated in October. The most beautiful bridge is the long bridge going to Hattress. That is my favorite place. My special kiss was a goodbye kiss to my beloved husband, Jerry, just after he died. I travelled that bridge to scatter his ashes on a Hattress beach. Tricia I Love Reading your Awsome Amish Books!! I would Love to be a Winner! To the book Giveaway?? I Shared on my Wall Have a Very Happy Easter!! well of course that line should read” I cried and cried that I would not get to be a grandma”…but I have been crying while typing it, just remembering ….so a blooper or 2 is not bad. My special kiss: Was in October of 2011. My husband gave me my last kiss from him before he past away. It is my favorite because it was(is) my last one. We have had many over the last 45 years but this is the one I cherish the most! So sorry for your loss. You must have had a wonderful marriage. I don’t have a blog but I’d love to get in this contest! My favorite bridge is where I used to watch baptizings. There is a covered bridge in Gettysburg, that is just beautiful. It’s supposed to be haunted, smile. However, we have never found it to be so. I don’t have a link to the little bridge I remember crossing as a child & probably never had a photo taken of it. But it’s in my memory. It was a little foot bridge that crossed a creek in the woods that separated the 2 roads between which we lived. Every weekday evening, I would cross this bridge with my Mama as we walked home together (her from her work in an overall factory and me, from school). She never did want me to make the walk alone, so we met at my Aunt’s house, about 1/2 mile away. But I will never forget the little bridge, because it led to “home”. I always knew once I was on the other side of that bridge, I was “almost home”. It’s great to remember today that as a Child of God, “we’re almost home”. Whether it be by death or He comes for us in the clouds….we’re almost home. My most memorable kiss was the first one given me on my first date with my hubby. I was shocked. He was a preacher & I never expected the kiss that quickly. He said he never expected to kiss me. Howbeit was very quick, my aunt was in the car with my Mom waiting for me, and being a bit nosey….my aunt saw that kiss. She never lets us forget it. That first kiss has now led to almost 45 years of marriage and my husband pastoring 3 churches (one of them for 35+ yrs), and being parents of a mentally handicapped child. But thankful for God’s grace…He’s always there for us. There is a covered bridge on the grounds of Greenfield Village, Dearborn, Michigan, that is very pretty. My favorite bridge would have to be the Golden Gate Bridge at night. Everything looks so clean and beautiful with the lights from the bridge and city reflecting off the water. My most memorable kiss was telling my 95 year young grandmother that it was ok to let go and be with my grandfather. they passed 22 years to the day from each other. Holding her and and kissing her cheek was very special. The bridge over St. John’s River into Jacksonville, Florida. First kiss from my Great Granddaughter Izabelle who was I year old. She was born in Seoul, South Korea. I have never won a book and have ben an AVID reader most of my life. My first memorable kiss was with my first husband while we were still dating we had gone to the NCO club with the rest of our platoon when I was in basic training in 1980. As for my favorite bridge it would have to be the historic swinging Bridge in Mountain View Arkansas it’s been there since 1914. There’s a covered bridge in Conway nh that the Saco River runs under. we used to go tubing under it as kids. I still remember the beautiful echo beneath it. My favorite Kiss was in High School…….. My First Love……… He grabbed me and held me so tight and kissed me that I thought I might just melt in his arms……… still think about that kiss years later…….. Awwwwww !!!! Beautiful bridge would Golden Gate Bridge , very beautiful. We walked the whole way a crossed not knowing no bus to pick up us. My husband as afraid of heights and I have hip replacement so I said let’s go for it. We got over there , pretty tuckered, but excilliarting. God blessed with a cab that just comes thru to see if anyone needed a ride. First kiss was the time I was kissed by shel on our first date. He said I would really like to kiss you. I said why don’t you. He did. It was very special,soft,sensual, loving. We have been married now 12 years on May 7. The most beautiful bridge I’ve seen is the Natural Bridge in Virginia. God’s splendor is breathtaking there! Best kiss, my wedding day! My favorite kiss was when I married my husband and the minister said,”you may now kiss your bride”! We will be married 34 years this June! My favorite bridge is an old swinging bridge that is a few miles from where I live. My favorite bridge is in Corpus Christi, TX where I live. It is a lighted bridge tat changes colors and can show the American flag lighted up unfurling the flag or Christmas balls or even holiday greetings. It is gorgeous against the night sky. We take visitors to see it when they come to visit! I think it is the only bridge like it in the United States. I just love our bridge! One of my favorite bridges is the one between Stillwater, MN and Hudson, WI! and my first kiss from my first Grandson, Isaiah! (who turned 10 on April 7th this year!) And next best kiss, from my second Grandson, Quinton, who is in kindergarten! I don’t have a blog, but my favorite bridge is the Natural Bridge near Cherokee, N.C. And I would have to say when my grandson was born was the absolute best kiss. Every kiss I receive from my sweet husband is precious. My first real teenage kiss was.quite memorable. I remember taking a long walk afterwards and I was floating on air. I remember a kiss like that! I shared on my facebook page. Thanks for the opportunity to tell my Bridges & Kiss stories. Thanks for the contest & thanks for the opportunity to win a selection of books. My special kiss was not of the romantic type. My father died on July 16, 2012. He couldn’t talk at the end, but he could communicate with his eyes. He died at home like he wanted to, complications due to Alzheimer’s. I check on him at 5:00 in the afternoon and gave him a kiss. He got very teary, and died about 20 minutes later. He was not a demonstrative man and rarely hugged or kissed us. But to this day, I’ll never forget that kiss and his tears! He was a brilliant man, a surgeon, and knew what was happening to him. It was very frustrating to him and to the rest of my family. I still miss him! My favorite bridge is the Big Mac! The Mackinaw Bridge linking Michigan’s two peninsulas, fifth longest suspension bridge in the world at 5 miles. The kiss…a lady never tells! Let me just say my husband’s kisses rock my world! Shared on Facebook as Jennifer Jurrell Hibdon. The golden Gate bridge is the most beautiful bridge I have seen. The best kisses were the ones I got from my four Children. Love Bridges of Madison County near our home. My very favorite kisses now are from my great-grandchildren, when they just come over for no reason and say “I love you Grandma” and give me a kiss. Ages 5, 4, 3, 1, 1. I used to live in Marin County and there is something truly special about the Golden Gate Bridge!! The Mackinac Bridge in Michigan is my favorite and honeymooning on Mackinac Island was amazing! We have lived in the south 9 years and I still miss the bridge and the island! I love reading Amish fiction… I am reading one currently, by Jerry Eichler. I think the most special kisses are from my grandkids. I love when they are babies and start learning how to give kisses and lean forward with their mouths wide open. So sweet. My special kiss would be the day my first grandchild was born and I was there to hold her first. I kissed her on the forehead and thanked the Lord for her! Congratulations!!! What a thrill for you. Open to win a new book. Love reading. Am retired at 74 and have plenty of time to read. Thank you. I would have to say my special kisses are the ones that were given by me to elderly ladies and or the ones they gave to me when I was working in the grocery store for six years. I have moved on long ago to other jobs. But every once in awhile, I will see some of these same elderly ladies and we will hug and kiss on the cheek. You see one of these elderly ladies has no family; another has no family living near by, and one has enough love to go around for everyone she meets. A simple gesture goes along ways in a busy world. I shared the link to facebook. I have a covered bridge in my area (Martin Mill’s Bridge in Franklin County, Greencastle, PA) but it’s closed off for walking across the last I heard. My area (Franklin County) still has a few one lane bridges left to cross by vehicles, but over time they will be gone for road widening once money is funded. As others have been widen and became two lane road bridges for vehicles. Also in my area (Franklin County) had different structured bridges built back in the day; they have no been replace and or upgraded to Government standards. Some of these bridges had different arches, some were made out of different material than others, etc. The one thing that these bridges do have in common is HISTORY. Along with the fact that someone has taken the time to take their picture of future generations to view. My favorite bridge is Goddard Covered Bridge and it is located at Goddard, KY, a small village in Fleming County, KY. It is also known as The Little White Bridge and has become the setting for many weddings; it has also been featured in a national Ford commercial and several statewide campaigns. It is special because of it’s unique construction and also because of the view in the background. A small country church and a surrounding cemetery is visible through the opening of the covered bridge and its simple beauty is breathtaking. All of us are so proud to claim this landmark. If you would like a view of Goddard Covered Bridge, please use this link. Tricia, here is my blog link. My favorite is a cool covered bridge in Oregon near a friend’s vineyard. It is so peaceful there. Thanks for the great giveaway. My most special kiss was from my grand daughter at 7 months old . She had fallen off the cabinet and had to have surgery to stop a brain bleed from an artery. I picked her up in the hospital 2 days after the surgery and held her close and sang to her. She put her sweet little mouth on my face. It was the best kiss ever!! !